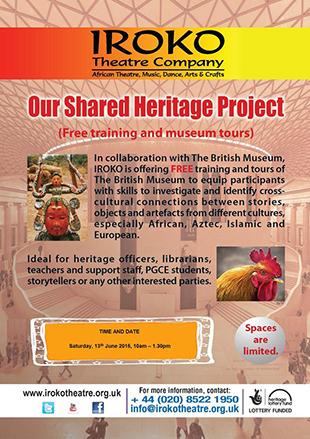 As part of their “Our Shared Heritage” project, IROKO Theatre are carrying out FREE training for library staff, nursery staff, would-be/nursery assistants, teachers, ESOL students, etc at the British Museum. The training session will be conducted by curators from the museum and focuses on equipping participants with skills to connect cultures through stories, objects and artefacts. It also includes a guided tour of approximately five galleries – African, Asian, Aztec, European and Islamic.